The Greenwich, a large wall mounted, flush fitting solid brass outdoor replica wall lantern. 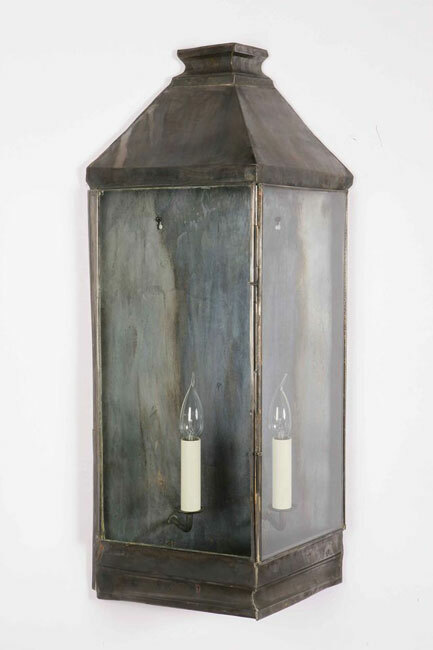 In an antique finish, with clear float glass lantern panels. To achieve this aged appearance, the brass on this outdoor wall light has been degreased and coated with a substance that physically ages the metal. This finish will mellow in time and requires no special cleaning to keep its wonderful colour. Each outdoor replica wall light is handmade making every one unique. As these are made to order please allow 4 weeks for your delivery. From our solid brass outdoor lighting selection. Handmade in the UK and finished to order. Timeless handmade replica lighting made to last a lifetime.